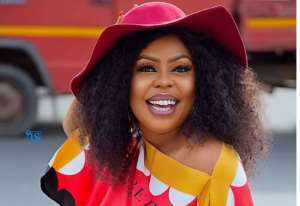 Controversial Media personality, Afia Schwarzenegger has revealed in an interview that she aborted the baby she had with her second husband. The comedian revealed that at the end of her second marriage, she found out that she was pregnant but decided to abort the baby because of the complicated situation surrounding the pregnancy. In detailing what led to that seemingly unfortunate decision, Afia revealed that she has been married thrice. She first got married to the father of her twins, who was brutally murdered. She then got married the second time to one Aboagye who she met online, and then for the third time, to Abrakwa who’s known by most as Afia’s estranged husband who threatened to pour acid on her. Afia further on revealed in the interview with Abeiku Santana on “Atuu” that her relationship with her second husband, started online and they dated for about two years, communicated often via Viber and Skype and that he even proposed marriage to her online. According to Afia, everything was okay during their marriage until she stumbled on information that led her to find out that her husband was already married to another woman. This breach of trust, she said, is what led to their break up and her decision to abort the baby.